If you have been looking for a company offering excellent service and party rentals serving Washington, D.C., then look no further than Rentals to Remember . This local and family-owned party rental company believes in providing world-class service and rental equipment to all of their clients. Here’s a brief look at Rentals to Remember and all they have to offer. Among a variety of table linens, china, and glassware, you will find more rentals than you could ever imagine with Rentals to Remember. 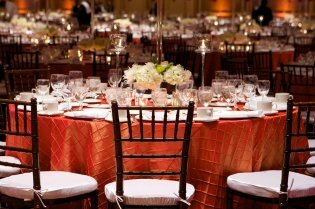 We offer decorations and dance floors, among various selections of seating options. Rentals to Remember takes the time to deliver and pick up rentals, but we don’t stop there. We will clean and sanitize all of these rentals, including the dishes before and after you use them. When it comes to dishes, all you have to do is clean off any remaining food, and Rentals to Remember will do the rest. By making your day easier in every way we can, Rentals to Remember is the only choice when it comes to rental equipment. Do not let your 4 th of July party be the same, worn out barbecue you have every year. This year, take advantage of party rentals and go all out for a truly memorable party. 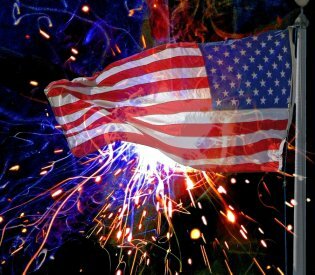 Whether you have themed table linens near Baltimore , or you decorate the venue yourself, you will easily have the greatest Independence Day celebration ever. One of the most exciting aspects of 4 th of July celebrations are the fireworks. Everyone loves when the sun goes down, and they can sit back and watch the bright lights and colorful patterns fill the sky. However, to truly appreciate the fireworks, you need to have a good view. Many people have a specific spot they like to watch professional fireworks—a designated neighborhood, a nearby military base, or a city landmark. If your city or county laws allow it, you may also consider lighting some fireworks in your own backyard. Always respect fire and safety rules, and make sure there are no structures, people, or animals nearby. Why not really impress your guests with some inventive dishes on your serving platters? Desserts are easily decorated in patriotic colors—colored cake, fruit dishes, and decorative icing, to name a few. If you want to really impress your guests with your creativity, research dinner and dessert dishes popular around the time of America’s forefathers. You can spruce up any Independence Day barbecue with some inventive food selections and decorations, so get started early and have fun celebrating. You cannot have a 4 th of July celebration without some patriotic decorations. Consider renting your china or glassware in varying colors of red, white, and blue. You can set up multicolored candles and strings of light that will bathe your guests in patriotic colors. Just like decorating your food, the options are endless when you decorate your party for 4 th of July. Whether you are having an outdoor wedding in the summer or winter, you need to consider the weather above all else. The weather will affect how the bridal party should dress, as well as how to make your guests comfortable. Consider renting a tent, fans, or heaters, depending on the season. You may want to advise your guests that the venue is located outdoors, so they can dress appropriately. Also, if there is a possibility of rain, then you should have a backup indoor venue or tent in place. Bugs probably only need to be considered if your wedding is during the summer, but they should still be taken into account. The food and guests’ perfumes are just a few different fragrances that might attract some annoying flying insects. Instruct the caterers to have the serving platters covered at all times until guests begin to eat. Offer your guests some bug spray—sunscreen may not be a bad idea either—and set up bug repellant candles or nets around the food and wedding venue. Encourage your bridal party to not wear perfume, and consider using silk flowers, rather than real flowers, as part of your decorations. One great thing about outdoor wedding venues is the customizable lighting options. You can rent floodlights or hang delicate strings of lights around the venue. Recreate a firefly effect with waterproof submersible lights floating in mason jars. Set up tiki torches to create an island feeling, with the added benefit of keeping the bugs away. The options are almost limitless when it comes to lighting your outdoor wedding, so enjoy the experience. 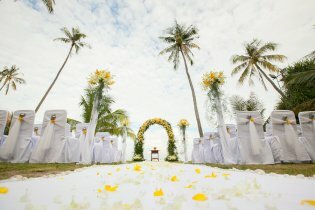 When picking a wedding location and date, you should consider what kind of rental equipment you will need . Renting in Annapolis does not need to be a difficult affair; just consider the time of year your wedding will be, and how much certain venues and items may cost. As you can see in the short video, there is no right or wrong date or location to have a wedding. However, try to consider your guests and their availability. Just before holiday weekends can be a good time, but be aware of rental equipment availability. Depending on the holiday, many companies might be renting out their serving platters and table rentals for the weekend, so be sure to book early.